Given the recent Federal Open Market Committee meeting in which they released a new set of economic forecasts, I wanted to follow up on the FOMC forecasts for nominal gross domestic product (NGDP) and, more broadly, NGDP Targeting. See this previous post and accompanying set of slides for background. The following are graphs of the Fed’s own forecasts for NGDP at three different time horizons (current year, 1 year ahead and 2 years ahead). 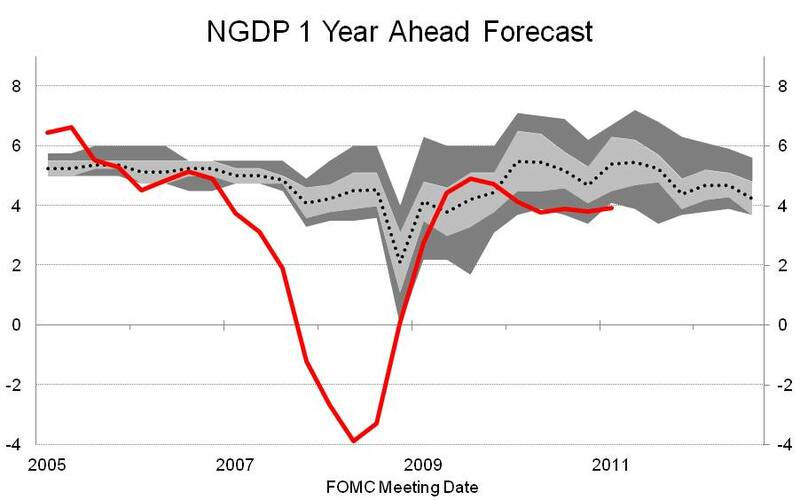 Over the past year or so, the Fed has been forecasting approximately 4 percent NGDP growth in both the current year and one year ahead, however their 2 year ahead forecast continues to project 5 percent NGDP growth, which is the rate of growth most economists who support NGDP Targeting view as an appropriate growth rate. 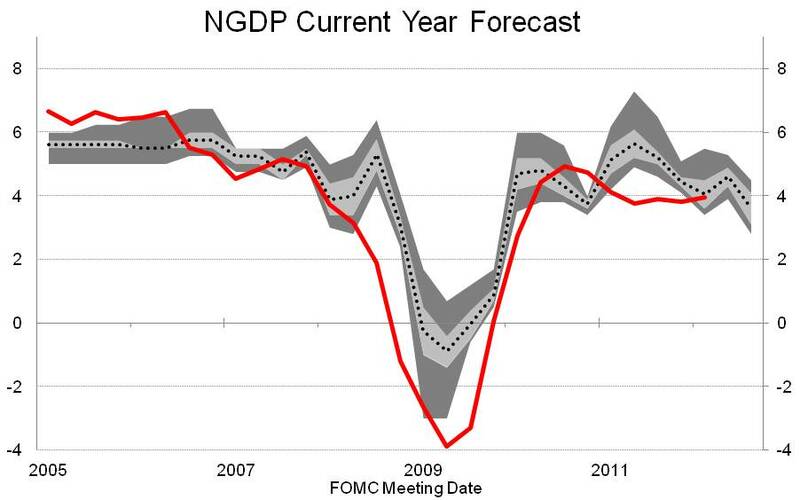 The light grey represents the central tendency of the Fed forecasts and the dark grey the upper and lower ranges. The red line is actual year-over-year growth in NGDP from the BEA. 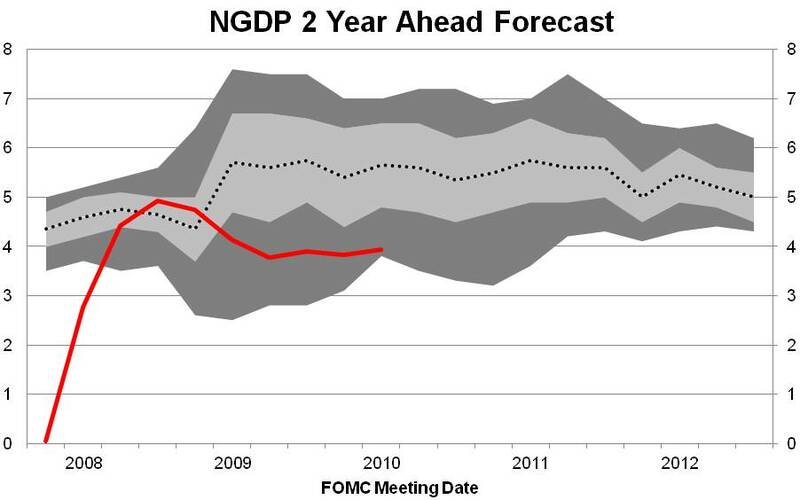 For 2012, the Fed now projects NGDP to grow between just 3.1% and 4.1% (Real GDP between 1.9% and 2.4%, Inflation between 1.7% and 2.0%). The outlook for 2013 has similarly been revised downward with NGDP growth projected at between 3.7% and 4.8%. As mentioned above, the 2 year ahead forecast remains relatively stable at approximately 5%, however the trend over the past few forecasts has been a slight lowering of the outlook. Overall NGDP growth has been lackluster in recent quarters – and years. Not since mid-2007 has NGDP grown above 5 percent and these downward revisions to the Fed’s own forecasts are bringing their outlook more in-line with recent, actual growth. Its excellent as your other content : D, appreciate it for posting . “If Christ were here now there is one thing he would not be–a christian.” by Mark Twain.